It’s that time of the week again, and PCGamesN returns to help you cut through the noise, and tune your signal into some of the most intriguing experiments in the indie scene this week, one enticing image at a time. Check out the latest crop below, and check back next week for more. Plus check our our lineup from last week, October 22nd, if you missed it! One of the great things about modern game engines is that a handful of good assets can go a really long way if used right. Astrokill has the look of a AAA game, but its exclusive focus on combat betrays its low-budget indie origins. 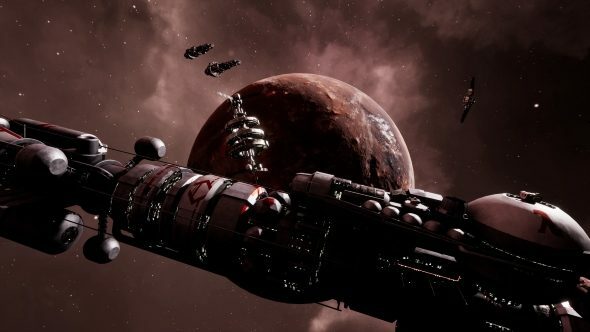 It’s a solid, weighty, accessible space combat sim. Playable fully with just mouse and keyboard, weapons are straightforward and easy to use, and there’s not many commands to memorise, meaning nothing gets between you and some space-murder. Astrokill has a heavy focus on chunky, gratifying physics. Guns are loud and powerful, and enemy ships recoil as they’re pummeled by your shells. It also has an interesting substitute for the energy shields you normally get in space combat games; an anti-gravity field, slowing down shots that would have been direct hits and diverting glancing blows entirely away from your hull. The game isn’t too far from completion now, and can be bought for just £7/$10 on Steam. Giant robot. Giant metal fists. A whole city that looks deliciously punchable. Really, do I need to say any more? RK3000 looks to be a whole mess of dumb fun, putting you in the shoes of a renegade giant robot pilot with plans to ‘liberate’ the planet through the time-honored art of punching everything. There is of course some conflict, combat and the occasional enormous boss the size of a city block, but for the most part, it looks like you’re just on a wildly cathartic joyride, with your pilot snarking her way through your choices of buildings to flatten. There’s no release date on this one, but it’s looking surprisingly enjoyable already. Keep an eye on it via its official site here. Another game of space combat and physics this week, although Nimbatus is firmly locked to a 2D plane. Build and adapt the design of your space-drone to fit whatever mission you’re assigned, be it a massive mining operation, a weapons-free race, arena combat or even an entirely AI-driven robo-sumo competition. The trailer above is somewhat outdated, but you can see plenty of cutting-edge gameplay clips on their official Twitter feed. Fans of luminous laser-beams and explosions should check it out. Nimbatus will be releasing a playable demo and turning to Kickstarter to fund the remainder of its development on November 2nd. Make sure you keep an eye on this one and its official site over the next week! Loud, dumb, shooty and obviously tongue-in-cheek – and that’s just fine. NUTZ is a platform shooter/metroid’y thing about anthropomorphic squirrels (and other furry friends) fighting an army of space-reptiles and their robot army. A playable demo was just released yesterday, so you can give this one a try straight away. It’s pre-alpha at the moment, so still early days yet, but it should give you a feel for how the platforming and combat will work as development continues. Grab the demo and check out some extra screenshots on the game’s official site here. The developers are hoping to fund development of this through Patreon. Currently they’re not raking in too much, but they’ve only officially been a studio and working on the game for a few months now. Here’s hoping the demo drums up some more interest in the game. Fans of Avatar (The Last Airbender, not the James Cameron one) should pay very close attention to this one. Remember how cool Earthbending was? Being able to carve weapons, defenses and more out of rock? Yearn is all about that, and the above GIF is an especially spectacular example of the kind of things you can do when the ground under your feet obeys your commands. Plus, I love the Smash Bros’ style effect for enemies getting punted off-screen. There’s not a huge amount of information out about this Yearn, other than plans for it to be at least partially rogue-like in structure. You can check out the developer’s Twitter feed for a ton more gameplay footage, including some nice demonstrations as to how various types of ground affect your powers, with sand erupting into high pillars, while other types of rock form and fade peaks more slowly.